Chiropractor, are you crazy? Why wouldn’t you want to be a REAL doctor? For most of my academic life, I was very successful in the classroom. So successful that it was almost expected that I would end up attending medical school. This expectation had two problems, a career path that meandered for 8-12 years and a philosophy that everything can be fixed with a drug. Ironically, I had issues with both of them. I worked very hard to receive my bachelors degree in biology from Wofford College. Unfortunately, everyone knows that an undergraduate degree in biology doesn’t take you very far without additional schooling. So I began looking at an array of schools in the medical field. One of my best friends told me that I needed to go visit his chiropractor because that profession may be one that would interest me. After spending a few days following his chiropractor, my thought was “this makes sense”. The two days that I followed Dr. Willis around his office confirmed alot of things that I had already learned in my biology courses. #1 God made the body to heal itself. #2 The nervous system is what runs and heals the body. #3 Interference to the nervous system means that one cannot function or heal correctly. #4 Chiropractors remove interference to the nervous system to allow for it to function and heal naturally. This chiropractic stuff was about the body healing on its own without drugs and surgery. That understanding of basic anatomy and physiology is what ultimately drew me to chiropractic school. Once I was “turned on” to the philosophic principles that chiropractic was founded upon, the next issue was what school do I attend. I think everyone wants to go to the best school possible, so they can get the best education possible, which leads to the best opportunity for success. What I found out was that Palmer College of Chiropractic in Davenport, Iowa was where it all began. Chiropractic was founded in Davenport by DD Palmer who delivered the first chiropractic spinal adjustment in 1895. If Palmer was the best and every other chiropractic institution was founded by a Palmer graduate, that would have to be the school of choice. Even today Palmer College is still considered the “Fountainhead” of the entire profession. The most interesting part of my education came upon starting my practice. I was shocked to learn that while chiropractors and medical doctors study the exact same courses for the first 2 years of schooling (anatomy, physiology, biochemistry, etc. ), we have totally different understandings regarding the body’s ability to heal itself. I see too many patients on too many drugs with too many side effects. So while chiropractic attempts to remove anything interfering with the body healing, the medical route leans too heavily on medication, which actually interferes with the bodies ability to heal. 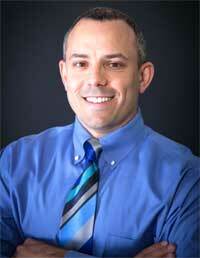 Dr. Porzio has been married to his wife Stacey for almost 17 years. Stacey works for Florence School District One as a school nurse at West Florence High School. They have 3 children: Abrianna, Brannon and Caedyn. All three children are fiercely competitive on the soccer field which means that most family weekends are spent on the road traveling for soccer. The family wouldn’t be complete without their dog, 3 cats and the occasional class hamster that Abrianna brings home.